At National Relief Charities, we believe that education is the key to long term, sustainable change for the poverty and difficult issues faced by Indian country. Through the American Indian Education Foundation (AIEF), a program of National Relief Charities (NRC), we commit substantial resources to education services that support school readiness and literacy. We also support colleges, both on and off the reservations, with a high proportion of American Indian students. AIEF has partnerships with many of these schools and provides support that helps school personnel influence student success. The low matriculation rate of American Indian students into college is a national crisis that largely stems from poverty and low access to information. This concerns AIEF and NRC because it helps sustain poverty on the reservations. Ensuring access to college and motivating American Indian students to view college as an option would help create long-term, sustainable solutions. Here we explore the barriers to education for indigenous students and offer solutions that can help these students access and graduate from college. Often, American Indian students are the first in their families to consider college. It is important for them to see professional role models such as lawyers, educators, nurses, and accountants from their own community — the people who can help make positive change for a tribal community — who demonstrate that college degrees are achievable and make a difference. Some American Indian professionals also make contributions by living in urban areas. Role models help to break the spell of disbelief and motivate more American Indian youth to attend college. The need for parental support or support of a primary caregiver or community member is also crucial. 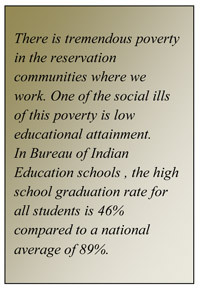 This is true for American Indian students and other students throughout the U.S. 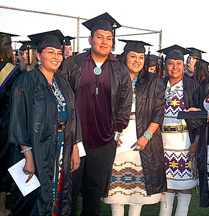 Encouraging and expecting American Indian students to start and complete college pays off. Students will rise to the level expected of them. It is why we ask students who apply for AIEF scholarships what support they have in their lives. You can hear our recorded discussion on this in our press room; the clip is named "Support, the Key to Student Success." Another major barrier for American Indian students is viewing postsecondary education as something beyond their reach. Yet many of the barriers that block these students from furthering their education are quite simple. These include not knowing how to search for a college that suits them, college application processes that are unfamiliar and intimidating, financial assistance processes that are unfamiliar and intimidating, and being unable to access adequate career advisement from school counselors because reservation schools are consistently in the lowest 10% of DOE funding and counselors are overburdened. All of the above makes clear that education is crucial to sustainable social solutions. It is critical that Native students have access to adequate information about college. It is also critical that Native students complete college and challenge the misconception that education is not an option. Providing Native students with adequate information about their options for a different future and helping them believe that these options apply to them is a start. Direct assistance focused on researching schools, financial aid applications, college applications, essay writing, and available resources for American Indian students can also help increase their access to higher education. AIEF awards 200 college scholarships to American Indian students each year. We have a highly effective postsecondary scholarship service that targets middle-of-the-road academic performers who have shown a track record of overcoming obstacles. Of the students selected for our scholarships, over 95% complete the academic year for which they are awarded. The norm for academic year completion, particularly among first-year Native students, is about 21%. Obviously, selecting the right students is a key to retention and graduation. We discuss this further in our AIEF White Paper on innate potential and Native student success. As mentioned, the majority of students selected for AIEF scholarships complete the college year and many of them go on to graduate. In addition, each year we also ask past scholarship recipients to conduct workshops that help younger students in their communities believe they can receive funding through our scholarship program and attend college. This approach has been successful in informing Native students and encouraging them to push through the barriers. AIEF also focuses on helping these students stay in college until they graduate. We help our partner colleges retain American Indian students in several ways. Matching grant challenges that motivate partner colleges to raise more of their own funds earmarked for American Indian students. High school to college transitional programs that help orient first-year American Indian students, many of whom have only lived on their reservations or in remote communities. Participating students experience the campus, financial aid, student support services, dorms, and the dining hall before the campus becomes crowded with other students. Funding to partner colleges for tools that are requisite to degrees in nursing and other health disciplines. These fees are often unexpected and unaffordable for our Native students. Granting emergency funds that partner colleges can allocate to American Indian students for unexpected emergencies such as memorials at home or health issues. It is not uncommon for Native students to leave campus mid-semester for family reasons and lack the funding to return to school. AIEF emergency funding helps colleges reduce dropout related to emergencies. To learn more about our educational solutions that help American Indian students reach their dream of a college education, please visit our web sites for the American Indian Education Foundation and National Relief Charities. For a copy of our AIEF White Paper, please email to PR@nrc1.org.